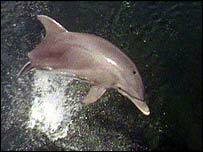 A dolphin that is regularly seen swimming in the English Channel and along the reef off Kent has been harassed by kayakers. Dave has been living off Folkestone for the past few months and is often seen swimming between the town and Seabrook. But there have been reports of jet skiers, kayakers and motorised boats getting too close to him. Police urged people to keep their distance after kayakers were seen harassing Dave on Tuesday. They said no-one should go within 100m of the dolphin. And people have been warned not to approach, grab, touch or try to swim with him. Pc Andy Small said: "Dolphins are well loved creatures and very friendly towards humans. "However, they are wild animals and should be treated with respect." Dolphins are protected by law and recklessly or intentionally harassing them could lead to prosecution, officers have said. Kent Police said the force Marine Unit would take action against anyone who annoyed Dave.